Apparently a lot of people were really happy when we finally started a new arc. I guess it’s been a long time since the last one. But now it’s over! Hope everybody had as much fun with it as I did. 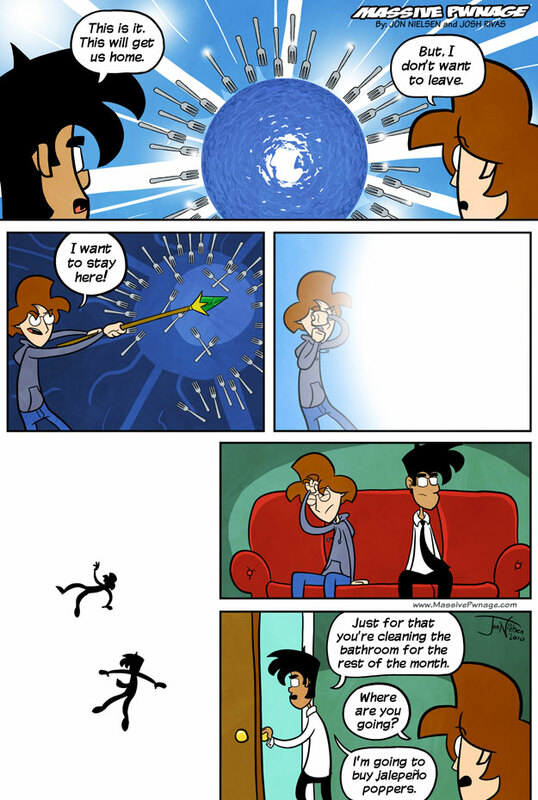 This entry was posted on Monday, October 11th, 2010 at 12:00 am and is filed under Comics. You can follow any responses to this entry through the RSS 2.0 feed. Both comments and pings are currently closed. Nope…all things as it should be. Powers gained in the game world should be gone. Key word on should. Ence and I never really think the plot out too far ahead, but that doesn’t mean we shouldn’t rule out the possibility. Soooo? Will be there some kind of Colonel Jack O’Neill or Teal’c showing up? Next Panel: Locke discovers the entire world is entirely made out of forks. Jalapeno peppers? Did we all forget what happened last time we bought Jalapeno peppers?